Ever wonder how Jennifer Aniston stays so slim, how Kim Kardashian keeps her curves, or how Dwayne “The Rock” Johnson sustains his monstrous, muscular physique? We all want to know exactly what our favourite celebrities are eating — how many meals a day, how many calories, how much protein — but stars’ specific meal plans have remained largely elusive. Until now. 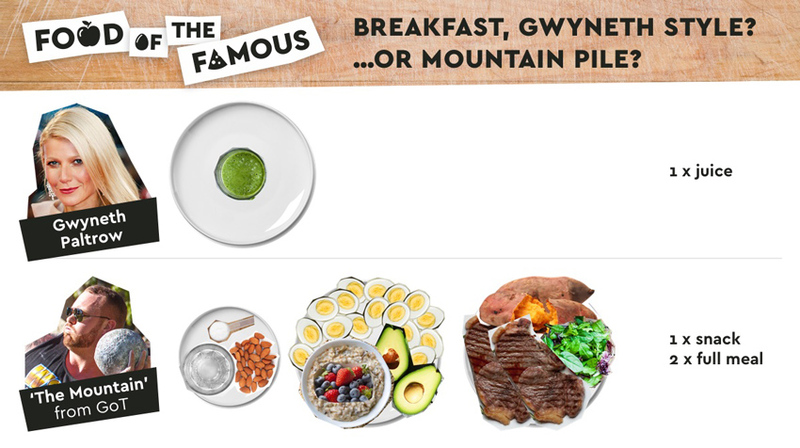 Thanks to a clever comparison infographic from Go Compare, we now know exactly what 23 famous athletes and celebrities eat every single day, and the results are somewhat surprising. Click image to open interactive version (via Gocompare.com). From Brad Pitt and Usain Bolt to Lady Gaga and even The Queen, the infographic goes into great detail, showing how many meals, daily calorie intake, amount of meat, and exactly what types of foods each A-lister eats every day. At the very top of the calorie list sits two-time European Strongest man champion and actor Hafthor Bjornsson, who plays The Mountain in Game of Thrones. He consumes a whopping 10,000 calories a day across eight meals. Compare this with super-slim Gwyneth Paltrow, who sits at the bottom of the list by eating just 1,300 calories a day — Bjornsson’s breakfast alone is more than what Paltrow eats in an entire day. Somewhat surprisingly, Thor star Chris Hemsworth comes in second in terms of calories, consuming almost 6,000 calories a day to bulk up for his role as the Norse god. This significantly more food than his co-star, Robert Downey Jr., who plays a fit, but less bulky Iron Man, and who eats nearly 2,400 calories fewer than Hemsworth. Take a look at the full interactive infographic here, which lets you compare the amount of calories, the amount of meals or the percentage of meat in the celebrity diets. Do these diets surprise you? Tell us what you think on Facebook!